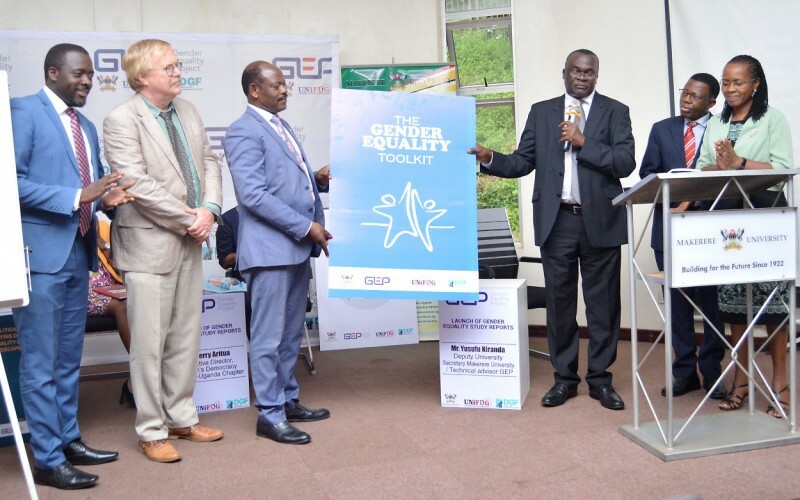 MAKERERE – The Deputy Chief Justice Alfonse Owiny-Dollo has appealed to academia to unpack for the community, the aspect of gender equality as enshrined in the country’s Constitution. This was at the launch of the Gender Equality reports and a tool kit for gender equality practitioners at the School of Food Technology, Nutrition and Bio-engineering Conference Hall, Makerere University. 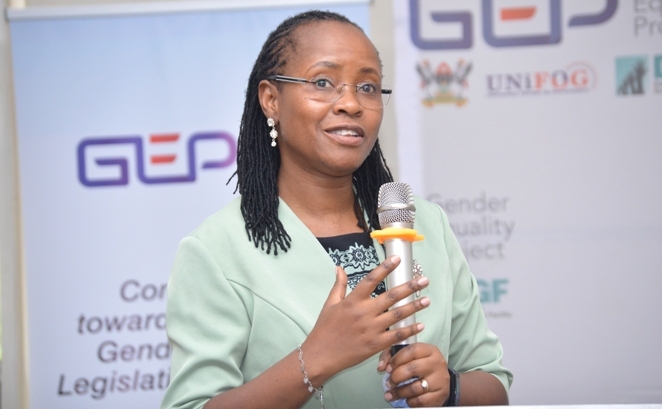 Makerere University School of Women and Gender Studies (SWGS) and the University Forum on Governance (UNIFOG) conducted two studies to enrich the knowledge system around gender equality legal and policy framework in Uganda under the Gender Equality Project (GEP). Funded by the Democratic Governance Facility (DGF), the studies were conducted primarily to inform improvement in gender equality laws and policies by identifying the pros and cons in existing gender equality laws, policies and provide recommendations for improvements. The two studies then informed the development of a toolkit on gender equality indicators, results, and measurement. This is among others caused by lack of deeper analysis of causes of gender disparity and addressing them. The Domestic Violence Act is, for example, a good gender law but without economic empowerment of women, rarely will the female victims report their breadwinners. The research helps in identifying these gaps and proposing ways of bridging them,” she stated. Assoc. Prof. Sarah Ssali, also the Dean School of Women and Gender Studies, Makerere University reported that there was an appreciation from the communities visited that stakeholders had over sensitized on issues of Gender Equality. She added that GEP carries out continuous horizon scanning on a weekly basis for any developments on the Gender Equality terrain such as communities adopting by-laws. The findings are then mapped with the GEP objectives so as to keep the Project in tandem with national dynamics. “It is important that this equality is unpacked and well explained. I am happy that in the Gender Equality Project, Makerere University and her partners to emphasize the equality of rights, voices, and opportunities for all, which is a contribution to unpacking the aspects of equality as enshrined in our constitution,” he said. He mentioned that DGF has extended support to several projects at Makerere University that aimed at contributing towards gender equality legislation in Uganda. DGF has also supported individual projects carried out by the staff of the University. 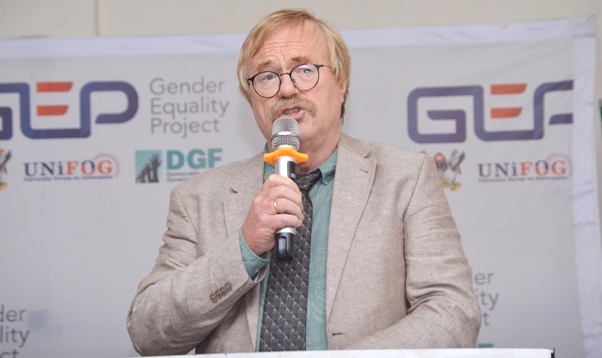 “Gender is among the three crosscutting issues in the current DGF programming. There is a need for all stakeholders to understand gender in a broad context beyond women, women empowerment and activism. Gender is not a women’s thing,” he said. 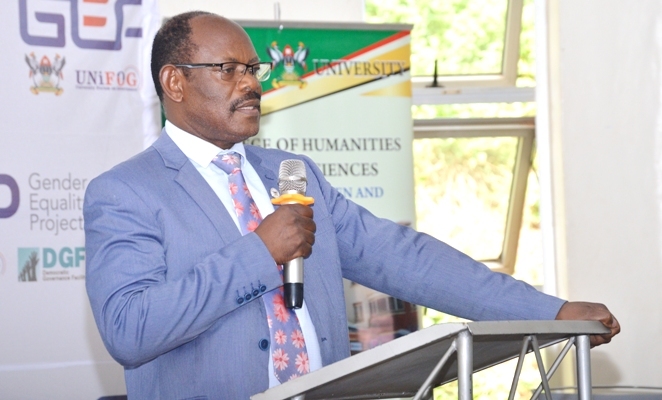 The Vice-Chancellor Prof Barnabas Nawangwe applauded the School of Women and Gender studies of the comprehensive research on gender equality. He said that Makerere through the School of Women and Gender Studies has demonstrated a strong commitment to ensuring gender equality in University.